The Senate of Environment and Public Works Committee Chairwoman Sen. Barbara Boxer tells reporters in Washington that she has mailed a letter to the nation’s governors asking for better safety measures for ammonium nitrate storage solutions. The hazardous chemical that is deemed to have caused the massive explosion is now extensively being monitored in chemical plants across the United States. 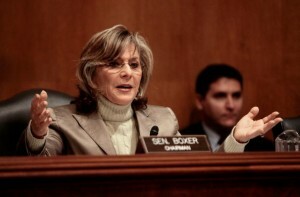 Sen. Barbara Boxer is taking the precautionary step to ensure the safe storage of ammonium nitrate. Boxer stated at a press conference, “We know what has to be done. Ammonium nitrate has to be stored in a separate facility… it’s not rocket science here”. Many outraged by the exclusion of ammonium nitrate not being on the EPA’s list of hazards that require oversight. Boxer calls this exclusion “outrageous” and is working to create a change.